NanoWriMo is over! If you participated and wrote more than you would have otherwise, you’re a winner. If you ended up writing 50,000+ words, that’s awesome! It’s been a week since NaNoWriMo ended so you’ve had a chance to distance yourself a little bit from the story. If you don’t have sufficient distance from your writing the danger is that when you read your Zero Draft you won’t be able to be objective. What I try to do is put my manuscript away for a week or two so I can come back to it with new eyes. In any case, after enough time has passed rescue your manuscript from the drawer and read it from start to finish. There’s only one rule: don’t edit until you’ve read the whole thing. This is torture for me, but it’s important to re-load the whole story into your mind without changing anything. When I read something that’s not right, a misspelling, etc., I want to go into the file and fix it but if I were to do that then I’d start adding sections that didn’t need to be added and deleting material that was necessary for the development of a future event. I find one way to lessen the temptation to edit is to print a hardcopy of the manuscript and, if I must make notes, then at least I can’t change the electronic file. By the way if you want to save paper and load your manuscript into an app that allows you to mark up a file I recommend GoodNotes, it’s the app I use. - Does a character’s name change halfway through the story? Is the name spelled the same way throughout the manuscript? Do all the names you use begin with a different letter? Are all the names sufficiently distinct from each other? - Is each character absolutely necessary to advance the plot? Can two (or more) characters be merged into one? Or are there too few characters? - Do NOT worry about grammar or spelling (other than for names) at this stage. If you’re anything like me, you’re going to end up not using a lot of the text in your Zero Draft. Fiddling with grammar and spelling would just waste your time. ->After your first read through. (a) What state of affairs represents happiness to your protagonist? Being together with friends and family? Winning the lottery? Retiring from their job? Going into business for themselves? Traveling the world? (b) What danger threatens to keep the protagonist’s dream from becoming reality? What is the protagonists external goal? That is, what concrete thing or state of affairs does the protagonist desire to bring about? For example, in Die Hard John McClane wants to protect his wife and the other hostages and defeat the terrorists. Is there a physical object that represents this goal? For example, in Raiders of the Lost Ark Indiana Jones wanted to bring the Ark back to the United States. In the recent movie “Arrival” the protagonist’s external goal is to understand why the aliens arrived on earth, to understand the alien language. Make sure you know what the protagonist’s goal is—it will form the spine of your story. I’ve written quite a few posts about story structure (link and link) so I won’t go into that here. But be sure that your protagonist’s external and internal goals are what drives the key scenes of the story. Another thing to focus on at this stage is that the protagonist has a suitably strong antagonist. You want the antagonist and protagonist to have the same goal and for it to be impossible for them both to achieve the goal. Also, it tends to work well if the protagonist and antagonist are alike in many ways. If the antagonist is the protagonist's nemesis then he/she will be quite a bit like the protagonist but differ in at least one important respect. In Indiana Jones and Raiders of the Lost Ark, Beloq is Indy’s nemesis. Both men are archaeologists and are driven to procure relics. But they operate by very different moral codes and view the relics they hunt for very differently. Indy appreciates the relics for themselves while Beloq is primarily interested in what the relic can do for him in terms of wealth or power. 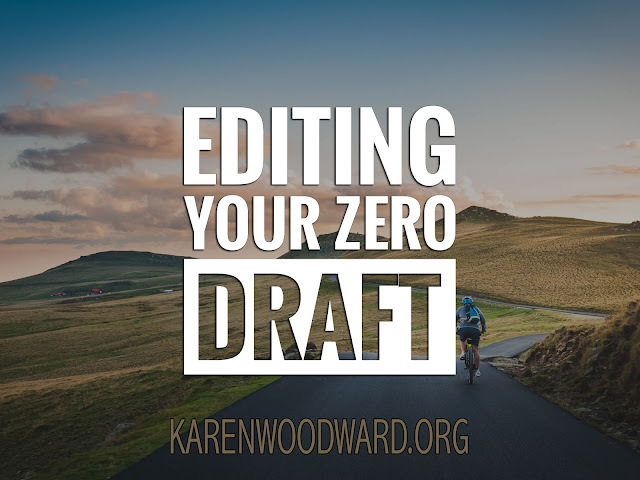 The number one thing that you need to keep in mind as you re-read your Zero Draft is to be kind to yourself. There are going to be awful bits and there are going to be glorious bits. Don’t stress about the disastrous passages, focus on the good, focus on what works. Stay positive. If you’re anything like me there are going to be a LOT of drafts between now and your final one. It’s a process of weeding out what doesn’t belong and gradually shaping the story. It’s early days still. If you keep at it you’ll end up with a story you love. Today I am feeling whimsical so what better book to recommend than Fantastical Beasts and Where to Find Them by J.K. Rowling. From the blurb: "When Magizoologist Newt Scamander arrives in New York, he intends his stay to be just a brief stopover. However, when his magical case is misplaced and some of Newt's fantastic beasts escape, it spells trouble for everyone…"
Hi, I jusy came across your blog, so forgive the temerity in posting so soon. I hope this hasn't been said before. I'm currently battling my way through making sense of 80,000 words of Nanowrimo. ONI garee with what you say, but here's one addition. Every time I re-read the text i change the font and size - the joy of wordprocessors, a couple of clicks and it looks totally different, I find i see a lot of things that way. It helps to stop me seeing what I thought I wrote. 80,000 words, congrats! And thanks for the tip.